Rock: conglomerate, quite brittle with a lot of little pillows of grass. In the place where trailul pass on the northern flank on the southern tip of the Ridge to the Howlers is a small saddle where they set up camp the climbers from the Army when they did the premiere of the routes of the following: the first route encountered, after 250 m of the saddle, is the Chimney Hanging, followed at 15 m from the Crest of the Central; after 30 m next entry in the route Front the south-west and the last trail at a distance of 30 km is the Route between the Cracks. 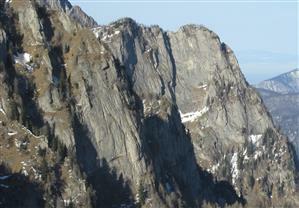 Continuing trailul get in the saddle wide in the upper part of the Ridge to the Howlers, where again the trail Schiel. In this place there is a pillar of the old funicular. The marked path goes up further on the stairs cut in the rock, secured with a railing from the cables, to the canton of Schiel who stands at the edge of the Plateau. 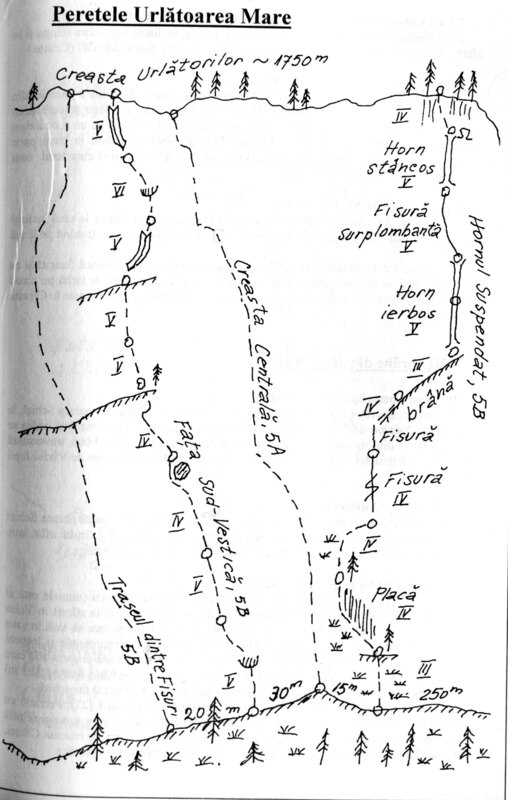 All the 4 trails out in the Crest of the Howlers, where it touches the path Schiel in the saddle mentioned. Access route: Access is from the Logs on the trail Schiel Valley Howlers to the point "Tables" (on the tourist route blue triangle). From there, a trail around to the left Edge of the Howlers, lead at the base of this wall the southern. Retreat route: On the tip of the forest, where the climb ends, we orient ourselves towards the north, following the ridge, partly wooded, up in the Road Howling.